Bread Tray Double & Single Dolly | Drader Manufacturing Industries, Ltd.
Add convenience, efficient tools and versatility to your bakery workspace. 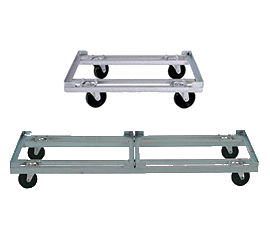 Dollies are ideal for easy movement in transportation or around your facility for quick stock replenishment. For versatility in your workspace, Drader Bakery Dollies and Hand Trucks are a way to easily change the layout of your bakery and workspace to meet your needs as you go.